Spend within your means. Be debt free. You have no idea how much your income really is if you're paying a lot of loans. Choose to always succeed in any endeavor. I can give you a long list why people fail but I can only give you one sentence why some succeed. They choose to succeed. People are flexible. Sometimes, they just decide to fight change. If they work change to their advantage, amazing things happen. When you’re starting out in the world of real estate, you might find yourself working seven days a week and putting in more hours of work than you rest. To some, this lack of work-life balance is an investment for higher gains in the long run. To others, the grind becomes a waste of time and they decide to give up. Clayton Gits started out working seven days a week. He didn’t want that. 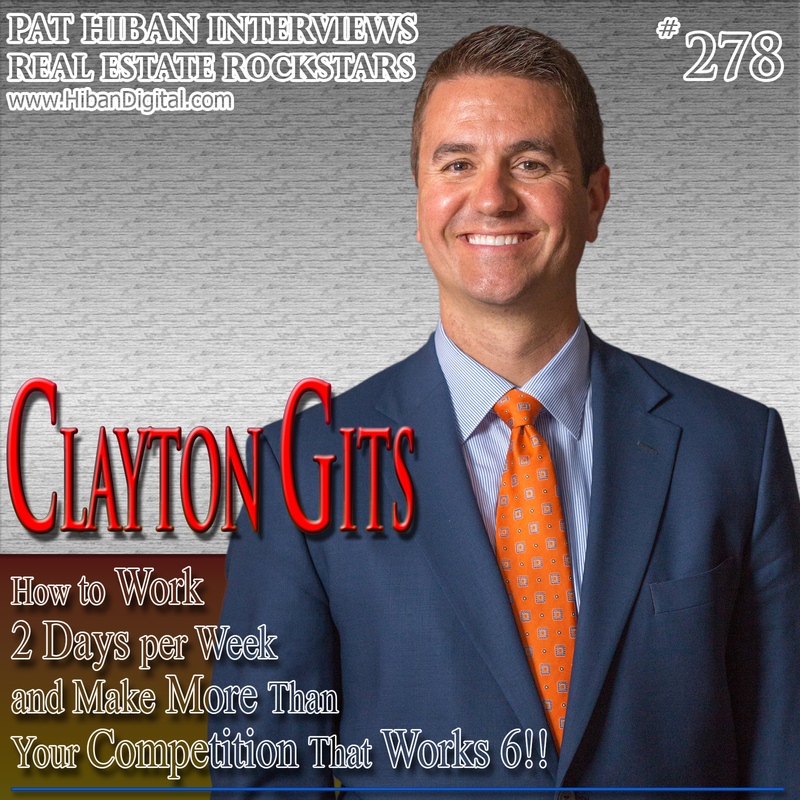 As a top producer during his very first year, Gits sold 28 houses and over $4,000,000 in sales and decided to come up with a plan that would support him working only two days per week. But he remembers the days when he was in debt. Once he paid off that debt, he realized that there was a significant difference in the amount of income he received. It changed everything. He wanted to live from a point of abundance rather than scarcity. So he worked hard to get to that point and stay there. Like many others who have gone through so much, Gits realized that if you change, everything will change for you. I am not the same person now as I was when I started in real estate, because when I changed, my business changed. Gits underwent the same metamorphosis. When you live debt-free, it changes everything. The transition wasn’t smooth, nor was it flawless. Like so many of us, he learned from his mistakes but built on the lessons he amassed. With the vast experience and knowledge that he has gained, Gits wanted to share this information with newcomers to the field. That’s when he started becoming a leader. He led by example. I learned quite a few things from my conversation with Gits. Given that this was his second appearance on my show, he was still able to impart quite a few brilliant ideas. First, despite what people may say, you can live debt-free. Second, success is a choice. If you choose to succeed, you’re halfway there. Some dream of success. Gits showed us that while dreaming is good, working toward your dream is even better. Lastly, people can be flexible. If you’re afraid of change, it’s all good. But never let your fear be greater than your determination to succeed. Gits started in real estate in the year 2005. In less than a decade, he now owns a real estate company, a coaching company and a property management company. When asked what motivated him to succeed, Gits said the only way to move out of that situation was to be more than who he was. If you want more, you have to be more. If you want more, you have to be more. Everything at the onset is an investment. When you start in real estate, you have to sacrifice your time and sometimes, even your comforts. In the end, it will all pay off. Imagine if you were able to lead yourself away from a life of scarcity to a life of abundance — you could lead others in the same direction. When you lead by example, you don’t need motivational quotes, threats or even promises to be convincing. Your life is a testimony in itself. You chose the right road even though it was filled with potholes. You had faith that it would get you here. People won’t question your credibility; they won’t even question what you know because the things you have taught them, the things you have shown them were things right out your own life’s history book — and that is more than enough. Gits owns several businesses and still finds time to coach and mentor. He encourages people to give back in their own way. If he can achieve this kind of lifestyle, what’s to stop others from doing the same? I can’t help but wonder who the next Clayton Gits will be. You can decide right now that it’s going to be you. To have access to over 300 interviews that will help go from rookie to rock star, click here.